Our 10 Cup Pause & Serve Coffee Maker is a total must-have for any and every college coffee drinker out there. 10 cups of coffee are sure to be enough for you and your friends, even though you are not likely going to be brewing coffee for your whole group of friends every morning. 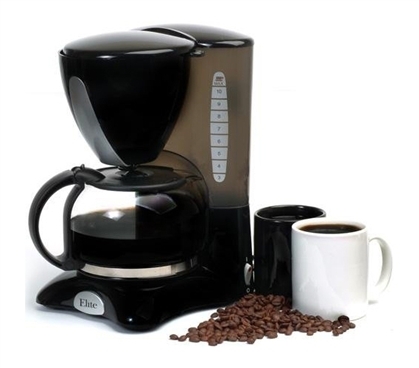 Our 10 Cup Pause & Serve Coffee Maker has a number of cool functions. Not only can you quite literally pause and serve, this coffee maker also has a water level indicator. For ultimate convenience for the average college student, our 10 Cup Pause & Serve Coffee Maker even has a reusable filter. It might stink to get up a few minutes earlier before class to put on a couple cups of coffee, but brewing your own coffee will save you a lot of money. Going to the campus coffee shop everyday quickly adds up, and that is unnecessary money that most college students don't actually need or want to spend. You can have more money for fun and social things if you kick your campus coffee cart to the curb and make coffee yourself.